In the popular imagination of the 19th and 20th centuries there persisted a belief that people of the past conceptualised the world as flat. However, there is limited evidence to support this understanding outside of religious cartography. Representations of the mundus (world) were almost always as a sphere, in alignment with Aristotle, Plato and Ptolemy. This tension between understandings of the earth formed in response to millenia old frameworks found in the Hebrew Bible and those developed out of observation and exploration still exist today. As the scientific revolution of the 17th century progressed, reconciling scientific observations and calculations with the Church’s teaching proved to be difficult. Some things were straight forward, like René Descartes’ (1596-1650) and Bernhardus Varenius’ (1622-1650) observations of the world’s size, composition, and age. Others, such Burnet (c. 1635-1715), sought to prove the Biblical origins of the earth, hypothesising a world filled with water in order to account for Noah’s flood. It was not until the 19th and 20th centuries with the discovery of fossils that this tension eased. 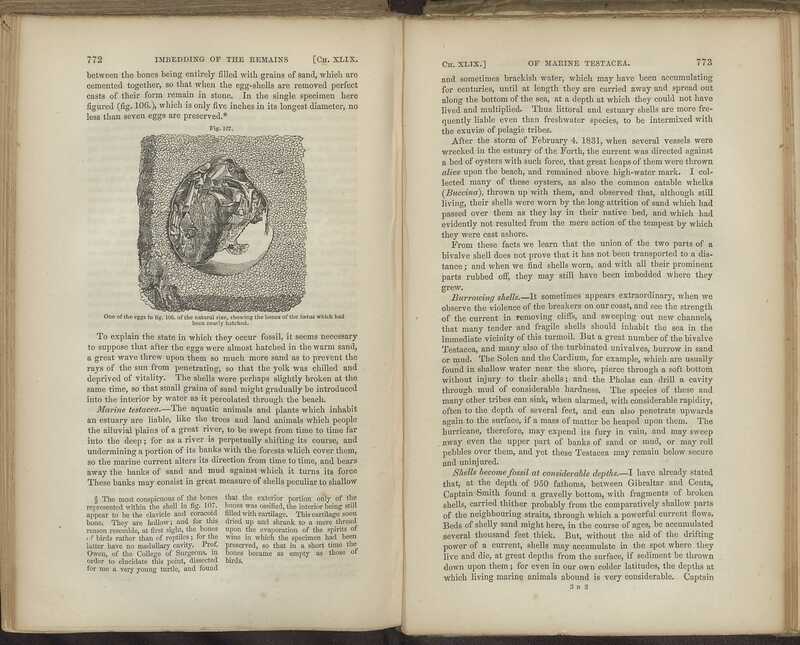 In his geological studies, Sir Charles Lyell (1797-1875) used a global study of fossils to demonstrate that the earth was much older than the 6000 years traditionally believed. 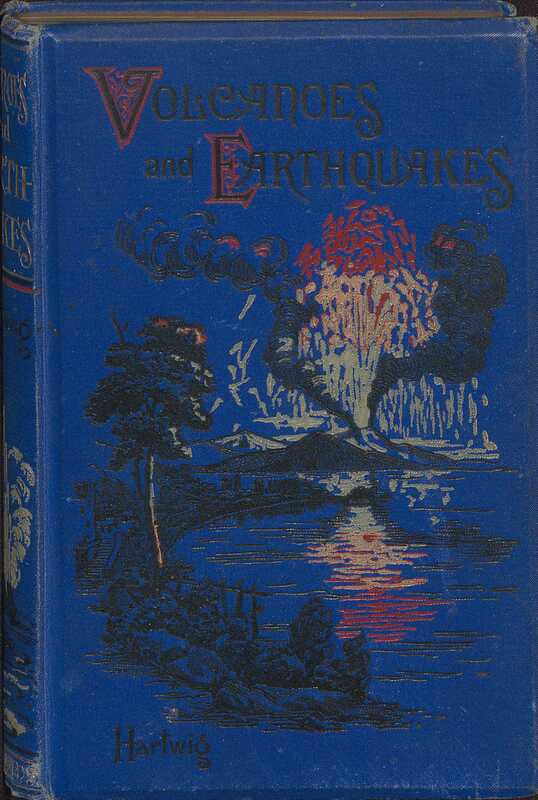 In the late 19th century, easily accessible scientific texts were a burgeoning genre for publishers aiming at the general population and all age groups. Hartwig was a professional science writer with many titles to his name. This pictorial cloth shows a volcano erupting and bears a school prize label to Herbert Middleton, from the Try Society Night School, South Yarra, Dec. 1893. As scientific knowledge and theory advanced, it became increasingly difficult to marry religion and evidence. 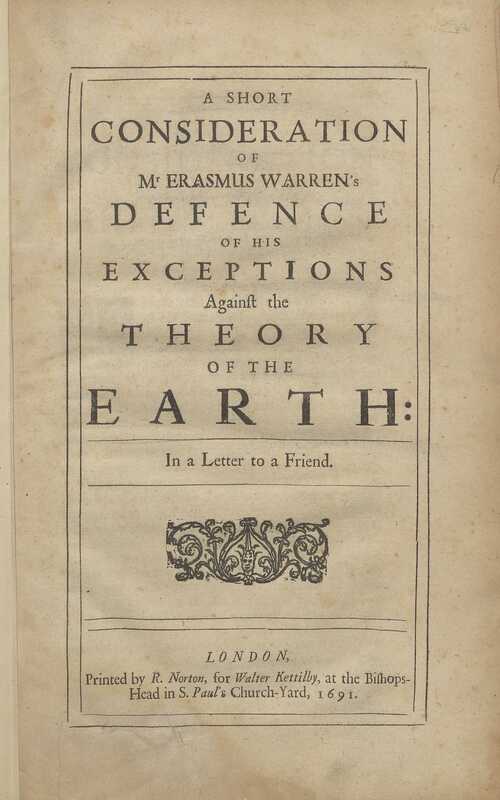 Burnet had published his Telluris Theoria Sacra, or Sacred Theory of the Earth in 1681, first in Latin and then in English. In it he proposed a theory of the Biblical flood. Through calculations he surmised there was not enough water on earth to account for the event, so put forth a theory of a hollow earth with water inside. This theory was admired by Newton, and Thomas Burnett debated with him in correspondence to try to find an adequate scientific basis for theological anomalies. Geographical diagram of the earth adapted for illustrating its movements & c.
Emslie and Reynolds combined to make a series of graphical representations of geographical principles in the mid-nineteenth century. These were particularly popular with children and those without a formal education. Emslie was the engraver, while Reynolds specialised in publishing educational materials. They went on to design A series of popular astronomical diagrams: executed in a bold, clear style (1847), which included intricate engravings of the solar system, with size comparisons relating to fruits for ease of understanding. 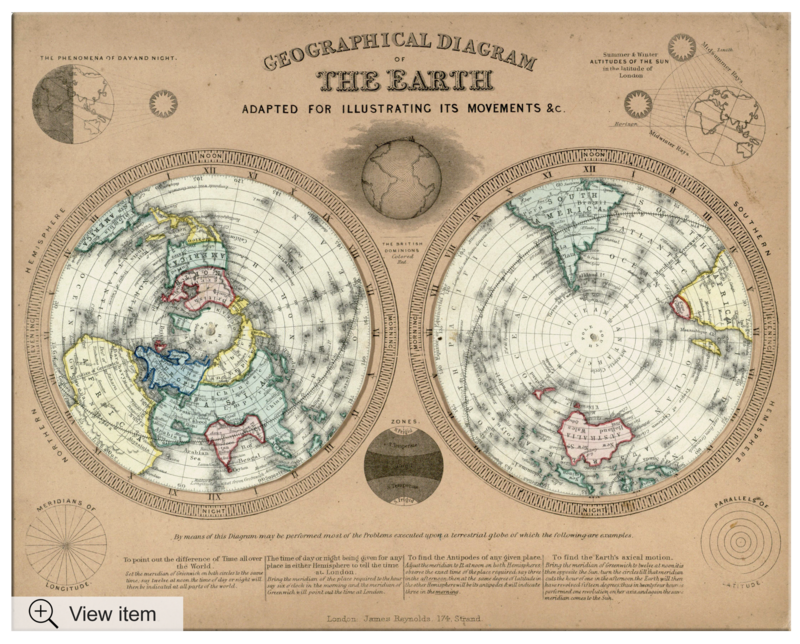 Their maps, charts, and infographics saw their admission into the Royal Geographical Society. In this Geographical diagram of the earth, two rotating, hand-coloured discs show the hemispheres of the earth. These are fixed to a 23 cm by 29 cm card which provides details on how to use and interpret the discs. This item is from the Lindsay Shaw Collection of children’s books. It has been digitised and is available in Monash Collections Online. 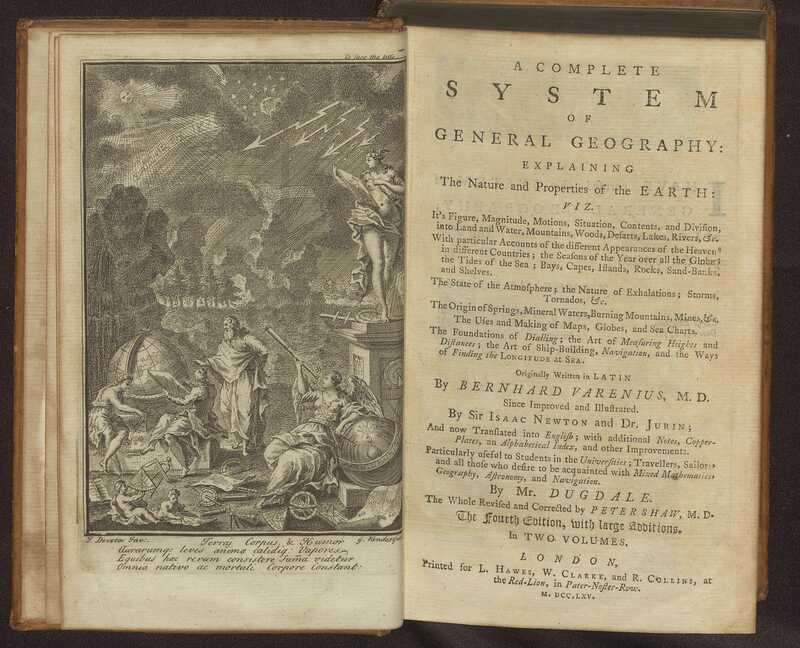 A Compleat System was first published in 1733, having been translated into English by Mr. Dugdale from the 1712 edition of Geographia Generalis, which first appeared in 1650. Part of the work’s title gives an indication of its aim: ‘Particularly useful to students in the universities’. 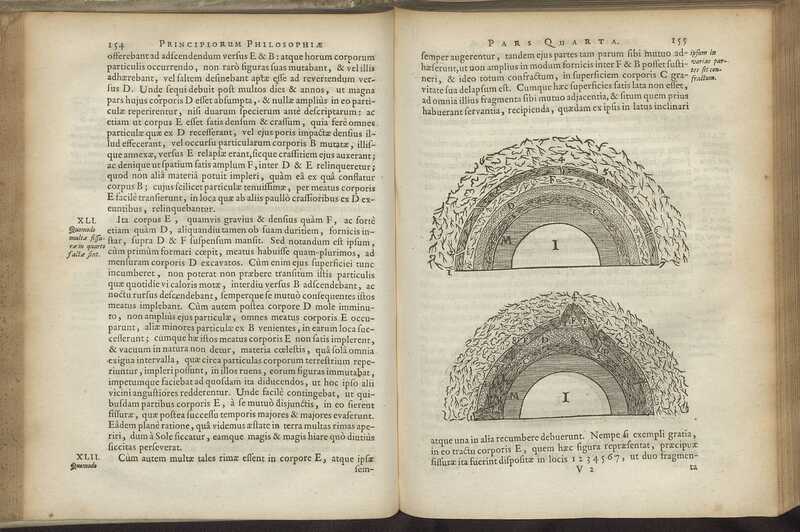 Varenius was a medical doctor, but had connections with many Dutch explorers and geographers, which he drew on to record a general system of geography. Translated into many languages throughout Europe, including Turkish, 100 years later it was still popular and being added to. There were many precursors to Darwin’s arrival at his theory of natural selection. One of the most influential was Lyell’s Principles of Geology which demonstrated the mutability of everything through geology. The Monash copy contains a bookplate of Frank Stanley Dobson with a presentation plate of the University of Melbourne Library, and bears the signature of B.J. Nielsen. 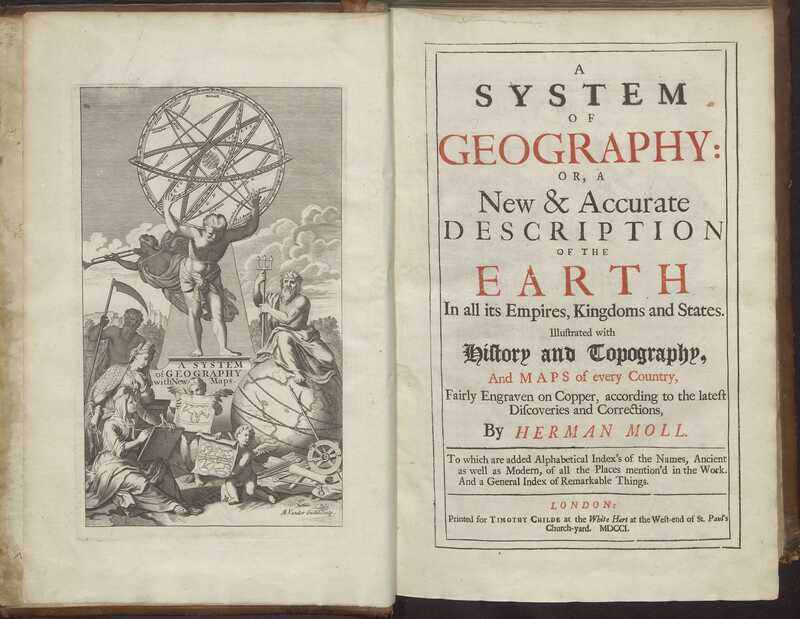 This book represents the importance of cartography in both political and scientific fields. Moll was the first to chart the ocean’s currents, aided with the data provided from Dampier. Moll was friends with Defoe, Swift, and Dampier. His maps were used for England’s political claims in North America and were continually copied and republished by others.